The Art of Taiko Drumming | The Art Of | Kids VT - small people, big ideas! If you go: Burlington Taiko is located at 208 Flynn Ave., Suite 3-G, in Burlington. The next six-week kids' beginner class series starts Tuesday, September 10, at 4:30-5:20 p.m. Classes are for boys and girls ages 6 and up. Tuition is $60 for six weeks. In addition to kids' classes, Stuart Paton does school residencies, assemblies and private events. For more information, contact Paton at spaton55@gmail.com or 999-4255. What to bring: Students should wear loose-fitting exercise clothes to class. All other equipment is provided. Contrary to geographical probability, Japanese taiko drummers are a familiar sight in Vermont. The loud, rhythmic adult taiko ensemble has become an integral part of both the Vermont City Marathon and the First Night Burlington Parade. 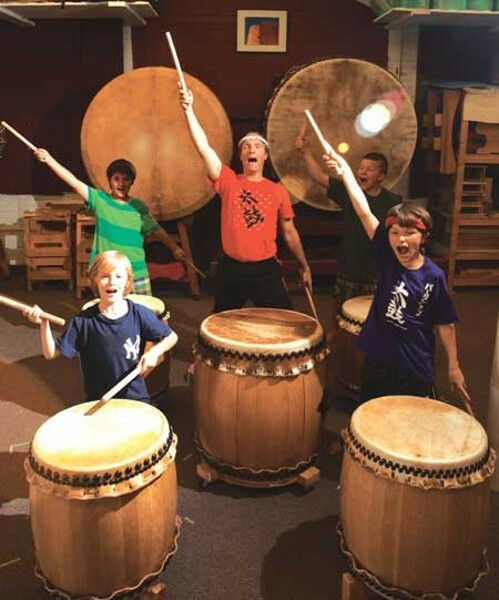 Less visible but just as surprising: For the past 20 years, Stuart Paton, founder of Burlington Taiko, has also been teaching this modern form of ancient Japanese drumming to kids. The lessons take place at Burlington Taiko's South End dojo — a Japanese term for a student gathering spot. Drums of all sizes hang enticingly from the white brick walls. On a recent summer day, seven school-age boys remove their shoes and bow as they enter. The boys line up shoulder to shoulder in order of seniority and sit in formal seiza position, bums resting on their heels and hands on their laps. "It automatically makes their backs straighter," Paton explains later. "The lungs can inhale more; their bodies are more alert." Paton, who wears a skinny red headband and a long, gray braid, was raised in Tokyo but didn't formally study taiko until he was a college student in America. "It's been a great way for me to be in touch with the culture and language I grew up with," he says. Through taiko, he explains, he hopes to teach kids about patience, politeness and respect. Within the walls of the dojo, students must address each other with titles of respect — adding "-san" to the end of everyone's name — and respond to Paton's directions with "Hai, Sensei," which means "Yes, Teacher." The group spends several minutes "air drumming" the piece of music they've been working on, while simultaneously yelling the Japanese vocalizations that correspond to each movement. Warm-up exercises that build strength, coordination and endurance follow. The boys scoot on their bellies like sea lions and skitter lightly on their fingers and toes like scorpions. "We do that to honor the physical energy and excitement kids arrive with," Paton says. When the boys are finally directed to pick up their drumsticks, a few of them break into smiles. They begin their drumming on tires wrapped in duct and packing tape, then move on to larger — and louder — practice drums made from drainage pipes covered with rawhide. To the observer, taiko appears to be as much a full-body workout as a music lesson. "Taiko is movement and music together," Paton explains. Intricate choreography accompanies each musical piece, involving arms sweeping through the air and a wide-legged, athletic stance. Paton uses visualization to guide his students. "Imagine your head as a bucket of rainwater. You're going to bend at the hip and pour it out," he explains while teaching one bow-like movement. Paton stands at the front of the room with his back to his students, drumming and vocalizing while the kids mimic his actions, working their way through a composition called "Matsuri Taiko." His demeanor is calm but strict. "Hands on shoulders," he directs when some errant drumming comes from the group while he is speaking. The boys respond immediately. Structure and discipline are integral to teaching taiko to the younger set, Paton says. But kids often catch on to complicated drumming sequences quicker than adults. "There is a full-body/heart intuition more immediately available with kids," he theorizes. One of Paton's pupils, 7-year-old Rowan, would probably agree. He started taking taiko because his grandma is in the adult ensemble. He points her out in a group photo on the wall of the dojo. She's still learning, just like him.